When I was younger, my cousins seemed so much cooler than me. They were older and handsomer and funnier, and my parents seemed to like them more than me. I thought it was because they were teenagers. Being a teenager was like having superpowers. I couldn’t wait to be a teenager. It seemed so chill — that was my plan, to be a Chill Teen. Little did I know that teens have no chill. Kara Zor-El has a cousin everyone loves, a cousin she wants to be like and a relationship with the world she wants to emulate, but she’s not there yet. In fact, the world doesn’t even know much about her yet — why she’s there, what she wants to do, and where she’s been all this time. Unfortunately for her, Cat Grant is the person who’s going to share this with the world. Today’s episode begins exactly where last week’s left off, with Cat’s car being whisked away by Kara so they could have their exclusive interview. Cat very quickly acts like she’s bored and above it all, especially when Kara’s answers to the basic questions sound just like Superman’s. When she pries deeper, Kara almost immediately slips up. “Ever want to start a family?” Cat asks. “Nobody asks my cousin these questions!” Kara snaps back, before realizing she’s told Cat more than she intended and flies off. Take a minute to ice that #topical #media #burn. But Cat Grant wants more than just a big feature: She wants a whole gala to mark the occasion, in a museum full of #influencers, which is really weird because she only asked Supergirl like five questions, and I am not sure she has enough material to fill more than a few clever-yet-kind-of-informative tweets. Of course, there’s a reason why it wasn’t smart for Kara to let on to Cat that she and Superman were related — it paints a giant target on her back for Superman’s deep bench of foes to take shots at. Like Reactron, a guy who looks like a nuclear version of Mickey Rourke’s character from Iron Man 2 and determines going after Kara is a good way to hurt Superman. He decides to get her attention by causing a multi-car pileup on the highway. And get her attention he does (after getting a reprimand from Hank Henshaw about the interview, which Kara tries to downplay by calling it “more of a private conversation that was published”). There’s a brief fight, which Kara wins pretty easily thanks to Reactron (dumb name provided by a photographer named Jimmy Olsen when said villain was making life difficult for Superman in Metropolis) having his battery short out. He bails. Back at the DEO, however, Hank says that Supergirl can’t go after him because he’s not a superhuman threat. He’s just a regular guy in some power armor, and regular guys, no matter how well-equipped, are outside of their jurisdiction. I’m not so sure about this stuff — Kara isn’t explicitly affiliated with anyone other than her cousin, and even though she works with a clandestine government body at times, who the hell knows or cares? I don’t know, Hank’s excuse is just super flimsy, and he pours salt in the wound by telling Kara to get her cousin to help apprehend Reactron. The next day at CatCo, Cat Grant is finding it harder to concentrate on writing than she remembers, and James and Winn have a surprise for Kara: a “super office” kitted out with all sorts of tech, set up in an old office that no one wants because a guy had a heart attack in there. I find this equal parts absurd and believable. I may be reading too many comic books. It’s here that Dream Boat James Olsen echoes Hank and tells Kara that she should call Superman for help with Reactron. Kara rejects this notion, arguing that if she calls Clark now, it’s over — she’ll just be known as someone who gets bailed out by her cousin. James then drops a bombshell: He nearly killed Clark once. Of course, Winn is still in the room, and now he knows Clark Kent is Superman. He tries very hard to start doing cartwheels across the office. Reader, I implore you: Make this your Twitter bio. Use it as your opening line on Tinder. Don’t let this moment pass you by. Anyway, Reactron captures Lord. (Do you get a vibe that Lord will slowly grow to become an important character? Good, he probably will. Call it a hunch.) He takes him prisoner, forcing him to fix the reactor in his suit. Wherever Reactron ends up hiding Lord must be a pretty cozy spot, because 24 hours later and no one has been able to locate them. Kara, in the meantime, is at work, giving Cat feedback on her Supergirl story. When Kara asks Cat for the rationale behind her story’s nasty tone and millennial label, Cat pins it on her young looks and assumption that when things get tough, she’ll do “what every millennial does and call her older cousin for help.” Cat Grant will not be impressed until she proves herself to be her own hero. Awwww, yeah, we’ve got ourselves a nice little generation war. 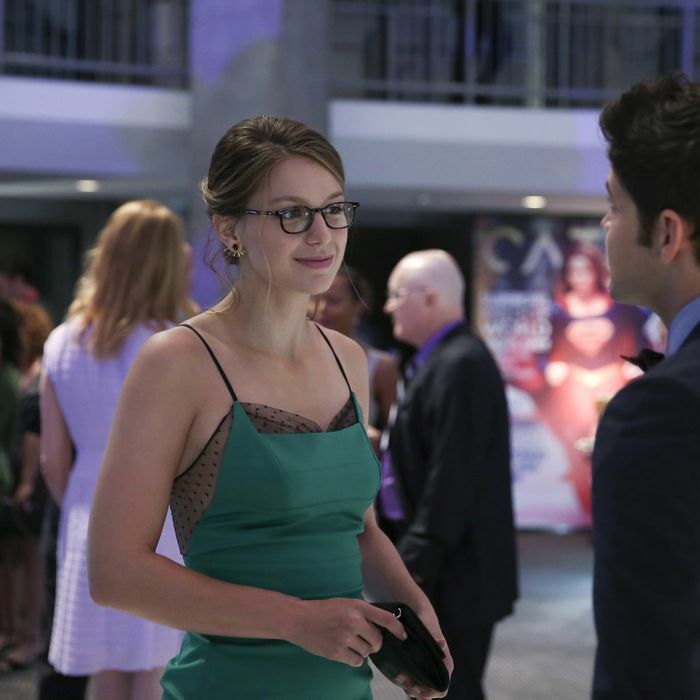 Kara, however, is pulled from this uncomfortable moment by James, who tells her Reactron has been found — and to avoid fighting him. Which is fine with Kara — she doesn’t want to fight Reactron. Her cousin did that. She wants to talk to him, try to understand him; and if that doesn’t work, she’ll go back to the whole punching thing. It doesn’t work. And this time, Reactron is now at full power and easily pummels Kara, who ends up under assault from his energy blasts and done for … BEFORE SUPERMAN HIMSELF SAVES HER. It’s a testament to Supergirl’s writing — as silly and exposition-heavy as it can be — that this moment is both shocking and a huge disappointment. We know how important it is for Kara to do this on her own, yet we’re stunned that Supergirl would have Superman himself show up (yeah, we only see his boots, but whatever). Kara wakes up in her apartment with Alex and James with her, watching the news (where jerk Maxwell Lord gives Superman all the credit for saving him) and learns that James called Superman for help using his Superman watch. Jimmy Olsen’s signal watch is one of those things that first showed up in the goofy Superman comics of the late ’50s and more or less stuck around for most of both characters’ comic-book histories. It’s exactly the sort of tidbit that you’d think Supergirl would drop in its reimagining of Jimmy Olsen as Total Dreamboat James Olsen, but it does not, and it’s wonderful. What’s more, it uses it to highlight a very important character beat — James tells Kara that it became a crutch for him, one he used whenever he was scared — and he was scared he would lose her. Kara’s response to this as they dance together during Cat Grant’s big gala (and leave poor Winn alone) is perfect: Trust that I am going to save the day. Then Reactron crashes the party. But even though she saves the day, things don’t necessarily turn out great for Kara. The next day, someone shows up at the CatCo office for James: Lucy Lane, younger sister to Lois Lane — and, it looks like, former love interest of James Olsen. Lucy wants to resolve the way she and James left things back in Metropolis, and James agrees to get dinner with her to talk. Kara, using her super hearing to eavesdrop, learns all this and is crushed. And then comes the best scene in the series so far. It’s an instant message from Clark Kent. At first, it isn’t much — he just says hi. After she thanks him for saving her, he tells her that he talked to Jimmy, and that what happened with Reactron won’t happen again. “I don’t know how to do this,” she tells him.